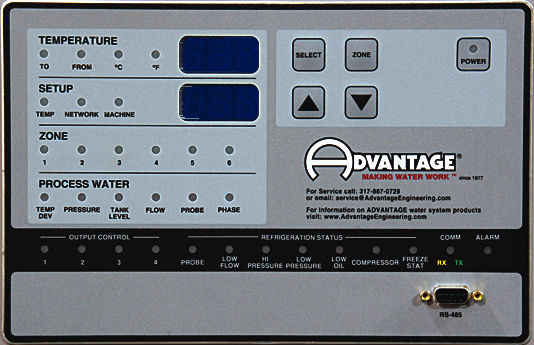 Advantage OACS air-cooled central chillers use mechanical refrigeration to cool recirculated fluid that support industrial process cooling applications. 20°F to 70°F fluid temperature range. OACS air-cooled glycol/water chillers use ambient air to dissipate process heat and efficiently runs in air temperature between -20°F to 95°F. OACS systems are designed for outdoor installation in most types of climates. 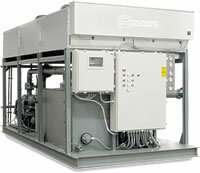 The air-cooled condenser, chiller zones, reservoir and pumping system are delivered as a complete package. 4. Consult pump curve for exact pump performance. 5. Selection of optional pumps for higher flow rates will raise the minimum recommended operating temperature when no glycol is used. 6. Approximate dimensions. Not for construction purposes. 8. See Product Warranty Statement W-700 for details on warranty.